This is a sponsored post with CIT Bank. All opinions are 100% our own. Do you remember “back in the day” when your savings accounts would have interest rates hovering around 3-4%? I was around 8 years old when I got my first bank statement and I had made “FREE” money off interest. Unfortunately, interest rates have slowly declined over the years to abysmal rates. So low that keeping your money in them might actually be a bad financial decision due to inflation. Luckily, CIT Bank just rolled out their awesome new product called the CIT Bank Savings Builder. It is a pretty awesome product offering up to 2.15% interest on your hard-earned money. So, sit back relax and let’s talk savings! Any time we consider using a financial company one of the first things we look at is how long they have been in business. This is a great factor to look at because if a company has been in business for many decades it shows a few things: trust, reputation, good products, great customer service, and most importantly good practices. When talking with CIT Bank we learned that they have been in business since 1908! Pretty crazy seeing how they have not only been in business for many decades but longer than an entire century. This simply goes to show they know what they are doing and are a great bank to consider when looking into financial products to help finance your biggest dreams. Well, do you like the idea of going on nice vacations? Retiring on time or even early? How about buying your next car with cash? Wouldn’t it be amazing to help your kids through college or even purchasing their first house? Saving is a HUGE aspect of your overall financial life. If you are not saving than chances are you are part of the 80% of Americans that are living paycheck to paycheck. Imagine losing your job, having a major car repair, or a medical emergency come into your life and you have no money to pay for it. Your only option is to put it on a credit card and go into more high-interest consumer debt. I don’t know about you, but that sounds extremely stressful and limiting to the life I want to live. This is one of the biggest reasons Brittany and I wholeheartedly believe in learning how to budget your money. Budgeting is the first step in changing your financial future and reaching your financial goals. 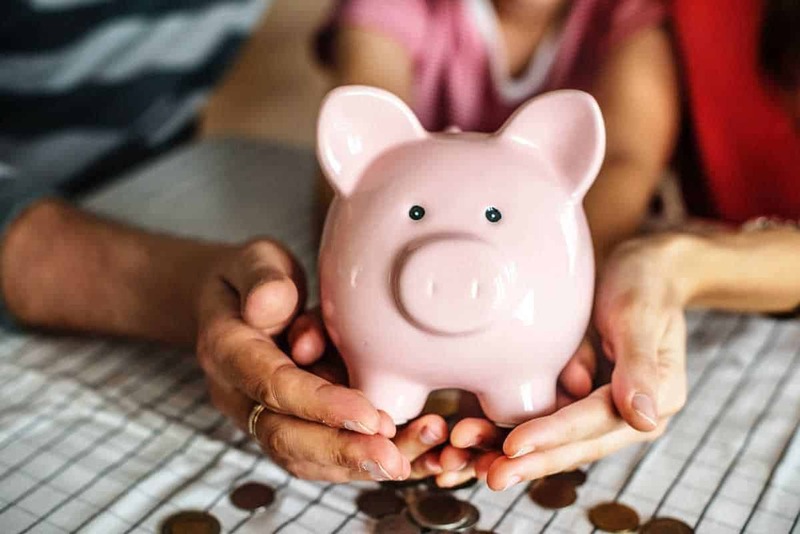 CIT Bank has come up with an awesome new savings account that not only offers a great interest rate, but it helps you form good savings habits with incentives! Talk about a savvy bank to set up an account with! What is CIT Bank’s Savings Builder? The Savings Builder is CIT Bank’s brand new savings account they just launched. 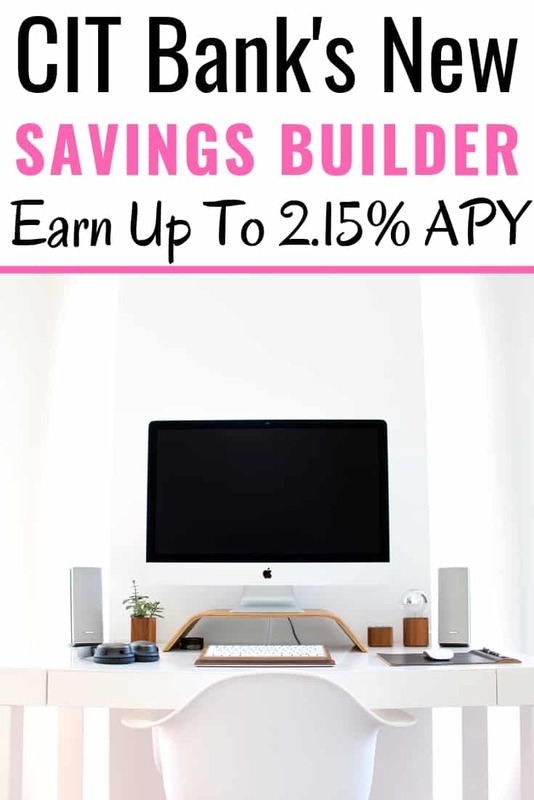 The Savings Builder is a tiered savings account that offers a competitive Annual Percentage Yield (APY) for customers that carry a qualifying balance or commit to a monthly qualifying deposit. After the first month, you can keep the high APY Tier by completing one of the following requirements. 1) Build a habit of savings – Make at least one monthly deposit of $100 or more. 2) High-balance savers – Maintain an account balance of $25,000. So, it is honestly not that hard to meet the requirements to earn the 2.15% interest on your money. Obviously depositing $100/month is probably the easiest way to meet the requirements and personally, that is the route I would choose. If you want to learn more and possibly open your Savings Builder today click here. How does it compare to other company’s savings accounts? All financial institutions are always looking for ways to reach new audiences and grow their customer base. Savings accounts seem to always be at the forefront of the competition. Here is another visual comparing savings accounts with some of the best in the business. As you can see, CIT Bank takes their competitive spirit seriously by offering the highest APY with their new Savings Builder product. CIT Bank also offers ZERO fees for their Savings Builder accounts other than the $10 fee for outgoing wire transfers (for balances over $25K it’s Free). When you are comparing savings accounts from one top competitor to the next it’s hard to really differentiate to see who the clear winner is. But as of right now CIT Banks Savings Builder seems to be one of the top savings products on the market. What are the fees, terms, and conditions to apply? Like mentioned above there are no fees associated with their Savings Builder. It’s always a good idea to read the fine print whenever opening a bank account. CIT Bank prides themselves in making their fees, terms, and conditions as simple as possible. Additionally, here are CIT Banks frequently asked questions. Click here to read all the details about their Savings Builder. How Secure is CIT Bank? Security is always a concern with all financial institutions, especially one that you might not have heard of in the past. CIT Bank takes security extremely seriously, as they should, given all of the federal regulations required of financial intuitions in the U.S. It is great to see that CIT Bank doesn’t just settle for what is required of them in regards to federal security regulations. On their security page, they discuss in detail the measures the bank takes to ensure customer data is safe. There are a lot of financial institutions that are offering savings accounts ranging from 1.50%-1.90% but CIT Banks Savings Builder seems to be the highest interest rate at 2.15%. We also love that their program is designed to actually help you make good savings habits and rewarding you for doing so. Over the last decade, we have seen many banks continue to offer products with rising interest rates. As consumers, it is a great trend everyone should enjoy seeing. Being a top-tier bank, they will continue to compete with some of the best offerings on the market for high-yield savings accounts. If you’d like to open a CIT Bank Savings Builder account simply click here to get started. Feel free to join our Facebook group The Savvy Couple Community to ask questions, learn more, and make some awesome friends. We are all about creating a judgment-free place to talk, learn, and enjoy everything personal finance. **Interest Rate is 2.127% during the Introductory Period and 0.995% thereafter.